I remember Night Court growing up. I didn’t get it, but I remember it. After many years of not seeing it, I was listening to some DJ mix and he dropped the theme song in there. Like a time warp, I feel back several years and recalled how Bull was my favorite– an obvious choice for a kid. 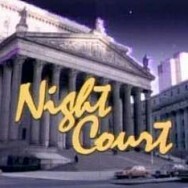 When my mom got sick this year, I would take advantage of her overly expensive cable deal and watch Night Court and Murphy Brown reruns. Mom would fall asleep in the recliner, exhausted from general recovery, and I would laugh along with the audience in the courtroom. I anticipate this being a memory as time goes on. There’s this thing about company, isn’t there? A feeling that if someone’s there with you, it feels just a bit better in some way? More secure, maybe? Assuming it’s the right person, of course. And as my mom was that person for me when I was young and sick, I had the chance to return that favor to her.